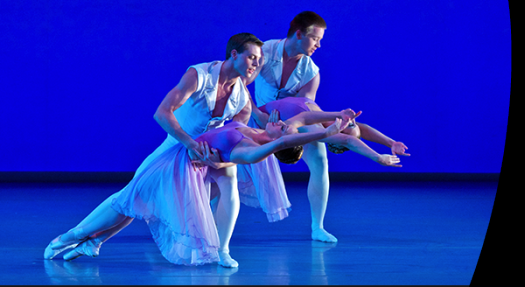 CCM Dance Concert Features Stravinsky's "Les Noces"
In Deirdre Carberry’s elegant re-staging of portions of Marius Petipa’s choreography for Alexander Glazunov’s 1898 ballet, "Raymonda," everything was energetically brought to life on the stage of Corbett Auditorium April 24 by a troupe of gifted ballet students. The Hungarian-flavored "Pas de dix" was danced with vibrancy by four soloist couples, with the excellent principals, Gabrielle Gulan and Jake Elwell doing fine work in their pax de deux. After a pause, three shorter contemporary works were showcased. Similar, with minimalist music by Chad Lawson and Brian Crain, they were immaculately choreographed by guest artist Anthony Krutzkamp as a set of duets that examines the vagaries of a couple’s relationship. Dancing barefoot and adopting a kinetic language encompassing classical ballet attitudes and modern dance moves, three couples intertwined, now erotically, now acrobatically, utilizing a sharp gestural vocabulary expressed amidst a whole emotional gamut of rejection, attraction and reconciliation. Dressed in casual clothes and isolated in their own pool of light, Katelyn Somers and Daniel Wagner elicited generous applause from the audience for their precise and emotionally-charged duet – one of the evening’s finest moments. "Chiaroscuro," with music by Liu Sanzang and choreography by guest artist Tian Tian, embodied a strong Chinese aesthetic, portraying the inter-connectedness of the forces of yin and yang. Beautifully lit by Joe Neumer, and perfectly costumed by its choreographer, the brief but substantial dance piece for eleven dancers had a hypnotic effect, jointly achieved by the confluence of the aural and visual elements that supported the at times hieratic, yet utterly universal choreography. "Prelude to Tomorrow," with music by Sergei Rachmaninoff and graceful choreography by Michael Tevlin, provided the joyful finale to the first half of the evening, as a handful of couples paired off, dressed in pastel costumes by Watercolours, while dancing against a gorgeous starlit sky created by Jeremy Dominik. This first portion of the program was the ideal showcase for the CCM ballet hopefuls, many of whom graduate and quickly move on to fill positions in dance companies around the country. The diversity of styles demanded by the four dance pieces, each its own dance world, provided a challenge that was met by the young dancers. After a brief pause, the ensemble took the stage to dance Igor Stravinsky’s "Les Noces," accompanied by the CCM Chamber Choir, a quartet of pianists, six percussionists, and a hard-working quartet of vocal soloists: Megan Slack, Hillary Grobe, Stephen Carroll and Simon Barrad, all under the unflagging direction of Earl Rivers. Andre Megerdichian’s choreography, with its angular, zig-zagging patterns, effectively responded to the percussive score of this 1923 ballet that portrays the gossip and talk and goings on of a 19th century Russian village in which a wedding is about to take place. All the dancers acquitted themselves with flair in their precise execution of the demanding choreography, and all the singers rode the implacably rhythmic, high lying writing while keeping company and balance with the accompanying quartet of pianos and the percussion ensemble. Better costuming should have been given the dancers than the black shorts, skits, pants and tops they got, which, side-lit throughout, tended to blend into the black backdrops that served as the only scenic background. The entire ensemble of dancers, singers and instrumentalists, including faculty artist, pianist James Tocco, brought the second half of the program to a rousing conclusion, once more asserting CCM’s preeminent position as one of the top centers for music, theatre, scenic design and dance training in the country. Rafael de Acha regularly writes on music, opera, dance and theatre for www.seenandheard-international.com and for his own blog/website www.musicforallseasonscincinnati.com This review was originally posted on those sites.